Course Director and DGM (Training) at Central Training Institute. Electrical supervisory Licence - Govt. of M.P. 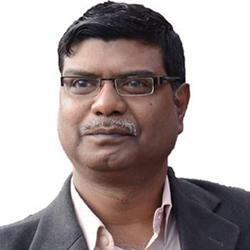 Dr. Tiwari worked for more then 25 years in operation and maintenance of EHV substations Equipments., Design, erection, installation and commissioning of EHV Sub-stations and EHV Lines. ISI Code of Practice. Testing of EHV equipments, relays, HT meters and instruments, Microprocessor based Protective Relays commisioning and testing. Distribution network planning, RAPDRP, Data Center Design and operation, GIS, MIS, MDAS etc, SCADA Project, ERP Implementation, Training & Human resourse Development. His name is listed in USA’s Marquis Who’s Who Directory in Science and Engineering as an Electrical Expert. He was honored as "Leading Scientist of the year 2005" by IBC Cambridge UK. Dr. Tiwari is member of many national and international professional bodies in Power / Electrical Engineering and participated in many national and international seminars / conferences. Two books on Energy Management, one book chapter and over 30+ research papers in reputed international / national journals and conferences. Six books are under publications.